Why You Should Use an Agent to Sell Your Home | "The Cole Team"
Selling your home is a big endeavor that should include working with an expert, a real estate professional. The Cole Realty team formed all the way back in 1970 with Scoop Cole’s father Harmon Cole. Since then, thousands of people trusted our family business to take complete and total care of them throughout the process of selling their home. There’s no comparison to the level of experience gained over the course of five decades. 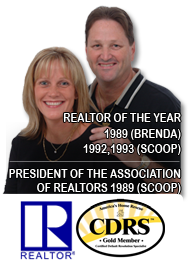 I sold real estate in Columbus, OH and surrounding areas until 1984 when I moved to Cape Coral. In 1989, my husband and I joined forces and decided to franchise with Prudential Real Estate. This secured us as the first Prudential affiliate in SWFL. When Prudential announced their decision to sell the real estate division and retain insurance, we decided to move on and look for a firm matching the level of professionalism. RE/MAX Realty Group was our choice, ranking as the number one real estate firm in Lee County with more than 100 top agents. - Among the country’s largest real estate brokerages, RE/MAX agents average more home sales than agents at any other national real estate franchise. - Of 1,705 of the largest brokerages ranked by sides per agent, data shows the most productive agents are with RE/MAX. - Out of the top 100 brokerages ranked this way, 88 are RE/MAX firms, with an agent average of 30 home sales in a year. - *2:1* RE/MAX agents average double the sales of other agents in the ‘Real Trends 500 Survey’ of large brokerages.